Myriad strives to turn breakthrough discoveries into diagnostic products and services that will save and improve patients’ lives, and we actively engage with leading industry and academic partners to achieve our goals. Our research partnerships are strategically aligned with our business objectives and allow us to access the best science worldwide. 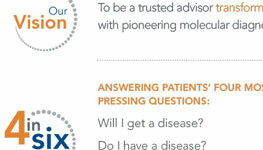 Learn more about our Companion Diagnostic Partnerships.